Sunday 6 April 2014. Harif/ Rambam Sephardi Congregation at Ohr Yisrael synagogue, 31 – 33 Theobald St, Borehamwood WD 6 4 RN. Operation Mural is a 55-minute documentary film as a tribute to the late David Littman. 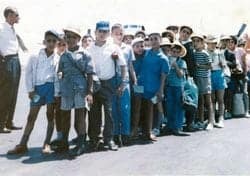 The film tells the little-known story of how 530 Jewish children were smuggled out of Morocco to Israel in 1961. Mural was the code name for Littman, who with his new wife Gisele Orebi – the future writer on ‘dhimmitude’ and Eurabia, Bat Ye’or – posed as an English gentleman to carry out this risky mission. In July 2009, over 40 years later, Littman was finally granted official recognition in Israel for his bravery and awarded the order of the Hero of Silence. Sephardi refreshments 7pm. Film 7.30 pm, followed by discussion. Tickets £9 per person, £15 per couple. To buy tickets, go to the Elstree S&P website http://www.rambam.org.uk/synagogueevents.php or call Ralph Levy on 0757 0052152 or 07805906046.